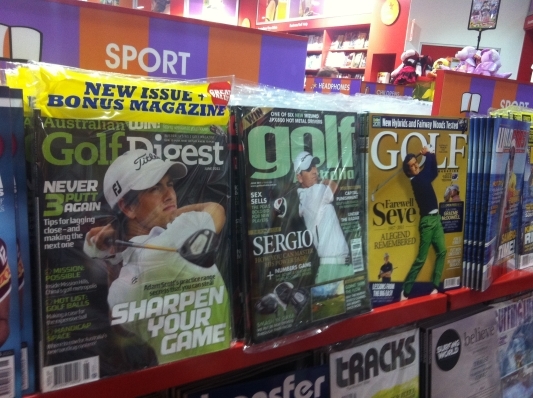 Which golf magazine should I buy? If you’re anything like me, you have at least one golf magazine within reach at any point in time. But with more than one to choose from, which one is best for you? One may be forgiven for not noticing the photo of a golfer on the front of golf magazines. They are shrinking beneath big, small and medium size text claiming you can win a set of clubs, improve your putting and and gain 40 metres, all by simply turning the page. And turn we do, and we love it. I know each magazine does its best to capture our attention but it wasn’t until Australian Golf Digest magazine ludicrously listed their rivalry with Golf Australia magazine as one of the 40 best rivalries in Australian Golf, that I began to realise just how badly they want our readership. Most of us couldn’t care less about the rivalry between golf magazines but there are some golfers who have a deep (and somewhat disturbing) loyalty to one golf magazine. I personally tend to mix it up and grab a different magazine each month but the choice is increasingly difficult with so much on offer. I’ve previously mentioned some of the free golf publications but here is a short description of the main golf magazines you’ll find on Australian shelves. Take any great claims such as “Australia’s favourite” or “Australia’s #1” with a pinch of salt and just decide for yourself. You can’t go wrong with Golf Australia magazine. It is always chock full of the latest golf news, comprehensive equipment road testing and course reviews that make you want to drop everything and go and play golf – Top Ten Public Access Golf Courses, for example had me on the fairways of Lost Farm soon after. Current offer: Subscribe and go in with a chance to win a Mizuno driver. If there is one golf magazine I gravitate towards more than others its Australian Golf Digest. That’s not to say I don’t buy other golf magazines but I’m more familiar this one. I’m not particularly taken by golf instruction articles but those in Australian Golf Digest always grab my attention. I also quite like hearing what Andrew Daddo has to say each month, but then again, I know some people who’d prefer not to. Each to their own. Current offer: Yearly subscription for $69, ends July 12, 2011. It is hard to differentiate these first three magazines, but for some reason Golf Magazine always feels a little more traditional than all the others. It is solid in terms of latest golf news and has those quintessential golf instruction articles by the greats. Its recent coverage of the passing of the great Seve Ballesteros was a great example of the sense of history and golf nostalgia this magazine conveys. Current offer: Subscribe and receive 12 issues for the price of nine. This magazine is the newest on the shelves and has come along in leaps and bounds over the past six months. Not quite as jam packed as the other golf magazines but The Golfer Monthly has a great variety of articles including tips, tour news and travel. The international travel section is particularly good. Great value for money and each issue is getting better and better. Current offer: Subscribe for 12-months and receive a sleeve of Bridgestone golf balls. Sick of being told how to fix your swing? Just enjoy playing golf for the sake of it? Here is a magazine for you. Specialising in golf travel, Golf Vacations features golf courses and getaways from around the world with the emphasis on Australia. I tend to file most of the articles under my “I wish” golf travel plans, but it has opened my eyes to some of the more affordable Australian golf getaways around. This was an independent review of Australian golf magazines. Aussie Golfer has no affiliation with any of these publications. ← Is Yani Tseng becoming the world’s best ever female golfer? Golf Digest hands down. I also buy the US version for the ads. I agree with Gordrock, Golf Digest is the way to go. Gordrock! I agree! I kinda like the ads too. Never been into publications. It’s the same old stuff most of the time with the odd good article. As for their tips, it’s much like the redundant stuff you see on Men’s Health magazines. Same stuff but just worded differently on the cover. Nothing ground breaking and nothing that I will fork over $6 for a bunch of advertisements. Hacker is easily the best. The fact that I own it probably does lend to some bias. However, I’m willing to put my money where my mouth is. Check out the website http://www.hackergolfmagazine.com.au. On the main scrolling banner there’s an offer for a free edition to “try before you buy”. No catch, just happy to have some more golfers check it out. We’ve only been around for 16 years or so. Looks like Hacker Golf hasn’t generated an edition since March 2012. Are you still running, Garry? Hey guys, isn’t golf ‘supposed’ to be an aspirational game? We’re always aspiring to be better, shoot better scores, putt better. That’s why Golf Vacations is an aspirational magazine, but still retains a lot of realistic places to play this wonderful game of ours, particularly in our reviews of Australian and New Zealand resorts. I think the golf magazines in Australia are all excellent but they cater for different markets…it’s just a case of whichever market you fit into. Enjoy reading them all. My friends & I have stopped buying GOLF VACATIONS as they were too lazy to spend a few minutes to acknowledge my job application. We buy all the other majors & also some O/S publications too, the British mag’s are quite good value. Also Golfer Monthly just went up $2 to $6.95 so value reason just went over the fence Out-Of-Bounds!! I enjoy reading all the golf magazines, it was TOP 100 PUBLIC ACCESS GOLF COURSES published in Golf Australia, Golf Vacations I enjoy also. and last would go to The Golfer, its now bimonthly and the editorial is full of rubbish hand-out pr stuff. The mags are now $9 each. Fat chance buying them. Hacker is crap now. The freebies r worth picking up and getting latest news on local stuff. Heaps of ads though but heaps of good deals.